In the future the most famous documents involving the Clinton Presidency are documents that are being hidden right now and not part of the eighty million plus documents currently in the Clinton Archive. They are the documents that PROVE Bill Clinton ordered the US Media to HIDE FROM THE AMERICAN PUBLIC the fact that sixty media executives got a specific warning about the Oklahoma City bombing that gave the date, the location and the name of the building destroyed on April 19th 1995. The sixty executives were named in a US Federal Court Case in 1996 the case number is 96CV 1499 Eastern District of Pennsylvania. These are some of the most powerful executives that run the US media. The warning was faxed to these top executives that run the major media in the USA in the days just before the Alfred P Murrah building was destroyed. In the future people know Clinton covered up this warning and as a result most of the population in large cities in the United States will be destroyed in the near future. The reason is the Oklahoma City bombing warning that was covered up by the direct order of Clinton was suppose to be a tool to allow one person to warn the citizens of the United States to LEAVE THE MAJOR CITIES of the USA or be destroyed in the coming age of Nuclear Terrorism. You can search the Clinton Archive on-line at www.ClintonLibrary.com, the key word you won’t find any documents on is SOLLOG (www.Sollog.com) . He is the person that CLINTON ORDERED THE US MEDIA to hide all information about his Oklahoma City bombing warning. Below are documents from US Federal court cases that back up this story. In all, there are now over 3,000 FBI Documents about Sollog and his famous Oklahoma City bombing warning that was so specific Clinton referred after the Oklahoma City bombing in his public statements that a ‘MASTER MIND’ was behind it. That mastermind in Clinton’s mind was SOLLOG. Do you remember hearing in the media after the Oklahoma City bombing happened that there was a ‘WARNING’. Well what happened to it? You don’t see information any longer in the media about a ‘WARNING’ do you? According to US Federal court documents in case 96CV 1499 where Bill Clinton was SUED by Sollog in Federal court, the US Government detained Sollog after the Oklahoma City bombing occurred. 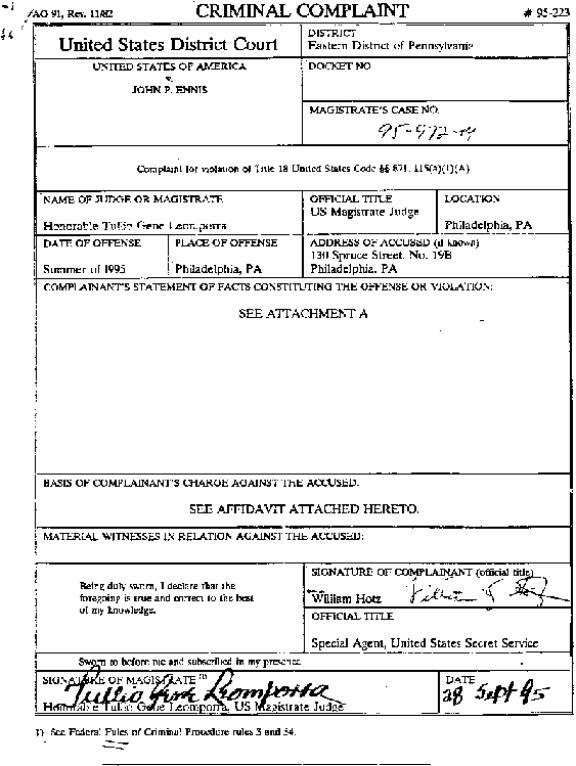 The US government later arrested Sollog in Philadelphia in September of 1995, the Criminal Complaint filed by the US government is below. The Secret Service arrested Sollog for warning Clinton would choke on a cheeseburger, suffer a leg injury and for warning Clinton to stay away from Jackson Hole if he didn’t want tragedy to occur. The Secret Service called these warnings THREATS. Sollog appeared in US Federal court on the charge in October 1995, he gave exact details in open court to the Federal Magistrate about a major assassination occurring around November 3rd 1995. One month later on November 4th Rabin was assassinated exactly as Sollog described one month earlier. The case against Sollog for warning Clinton to not go to Jackson Hole Wyoming again was then dropped. One year later, In the summer of 1996, Clinton went to Jackson Hole Wyoming on vacation, ignoring the Sollog warning, and his support plane crashed killing nine people. If only he had listened to Sollog. Clinton also ignored the Sollog warning and vacationed on the LINE OF SOLLOG that runs through Miami. Clinton slipped at golfers Greg Norman’s home and he had to have surgery to his knee. The warning Sollog was arrested for in 1995 also warned of a leg injury to Clinton. Sollog put exact information about Princess Diana’s death into his US Federal Court Case against Clinton that was dismissed as all such cases are, since you can’t sue a sitting US President while he is in office. Even the Washington Post mentioned this Sollog story. They acted like it is a false story, well the case is real, it is 96CV 1499 and exact information about Diana dying in France on August 31st is in that case. Here is the WP article about the Sollog claim. So you see, in the future people know that the United States was hit by Nuke Terrorism in large cities exactly as Sollog has warned since 1995 when Clinton ordered the US media to not report on Sollog. Looking back at that tragic fact, people know ONE MAN, who sued Bill Clinton for harassment, is the only person that tried to warn people in the USA that they needed to move from large cities. The person that kept the people ignorant of that warning was Bill Clinton and the documents that prove that are not in the Clinton Library. The name John P. Ennis is the birth name of Sollog the famous seer, so that name is on the documents below. 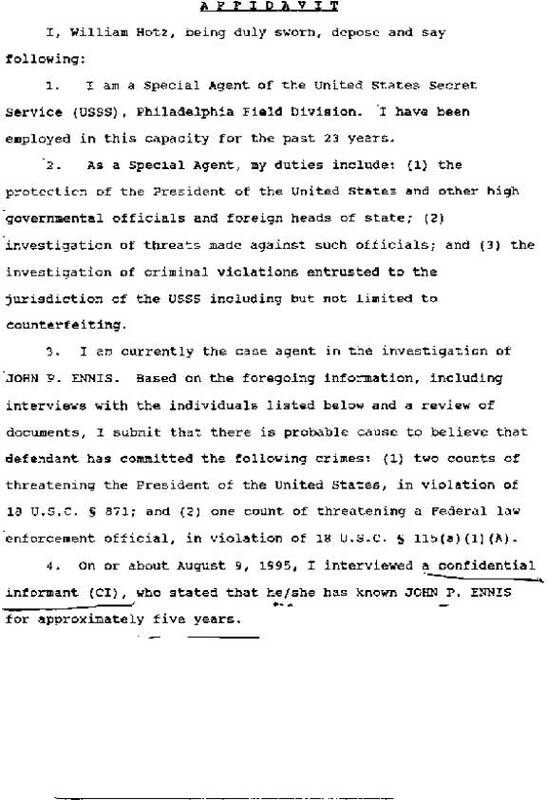 The documents are the Criminal Complaint against Sollog filed by the US Secret Service and the affidavit of the SS Agent in charge of the case that was dismissed.